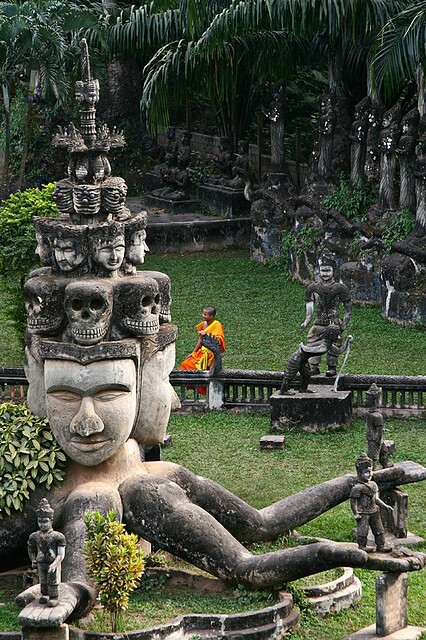 Buddha Park, also known as Xieng Khuan, is a sculpture park located 25 km southeast from Vientiane, Laos in a meadow by the Mekong River. Although it is not a temple (Wat), the park may be referred to as Wat Xieng Khuan, since it contains numerous religious images. The name Xieng Khuan means Spirit City. The park contains over 200 Hindu and Buddhist statues. The socialist government operates Buddha Park as a tourist attraction and public park. The park was started in 1958 by Luang Pu (Venerable Grandfather) Bunleua Sulilat. Luang Pu Bunleua Sulilat was a priest-shaman who integrated Hinduism and Buddhism. His unique perspective was influenced by a Hindu rishi under whom he studied in Vietnam. After the revolution in 1975, he fled from Laos to Thailand where he built another sculpture park, Sala Keoku in Nong Khai. He fled because his anti-Communist beliefs conflicted with the views of the Pathet Lao. After Luang Pu Bunleua Sulitat left, the state took control of his garden and made it into a public park. The statues are made of reinforced concrete and are ornate, and sometimes bizarre, in design. The statues appear to be centuries old, though they are not. There are sculptures of humans, gods, animals, and demons. There are numerous sculptures of Buddha, characters of Buddhist beliefs like Avalokiteśvara, and characters of Hindu lore, including Shiva, Vishnu, and Arjuna. These sculptures were presumably cast by unskilled workers under the supervision of Luang Pu Bunleua Sulilat. One notable sculpture resembles a giant pumpkin. It has three stories representing three levels - Hell, Earth and Heaven. Visitors can enter through an opening which is a mouth of a 3-metre-tall demon head (9.8 ft) and climb staircases from hell to heaven. Each story contains sculptures depicting the level. At the top, there is a vantage point where the entire park is visible. Another sculpture, an enormous 120-metre-long (390 ft) reclining Buddha, is also a park attraction.